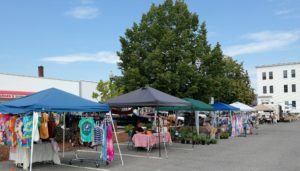 The Lincoln Farmers’ and Artisans Market takes place at Veteran’s Square (directly across from Marden’s) at 75 Main St. every Friday, late June-mid October, from 10:00am-2:00pm. The market usually offers a good selection of produce, perennials and herbs, some baked goods, eggs, maple syrup, berries in season, and locally made crafts. Find the market on Facebook, and check in with Jeremy Weatherbee at 794-6548 for more information.